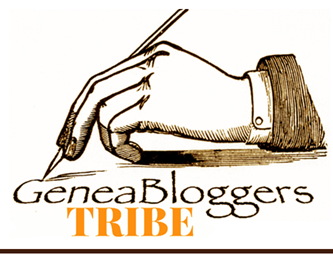 Thinking of parades for this week’s Sepia Saturday reminded me of a post I’ve been meaning to write for a while. 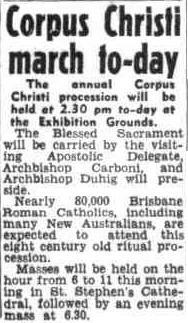 Growing up as a child there was one memorable “parade” every year when Brisbane Catholics would arrive en masse at the Exhibition Grounds for the Corpus Christi procession. This liturgical feast celebrates the belief that the host is turned into the Body of Christ during the Mass. In those far-off days, religions were demarked by denominational differences and it was unacceptable to attend a service in another denomination’s church, so Anglicans would not attend Catholic services, Catholics would not attend Presbyterian services etc. This applied whether the event was a family wedding or not and my family has several events where religion kept close family members away. The days of the 1960s ecumenical movement had not quite arrived, and Catholics were obsessed about the onslaught of Communism and the Red Peril. Catholicism and Irish were almost synonymous, with many priests and nuns born in Ireland or with recent Irish ancestry. It was only with the arrival of the post-war immigrants from eastern Europe that this started to change. In this community context, the Corpus Christi procession had an underlying element of defiance against the rest of the religious creeds. Unsurprisingly one hymn was sung with gusto, and some belligerence, was Faith of our Fathers (click to hear it sung). 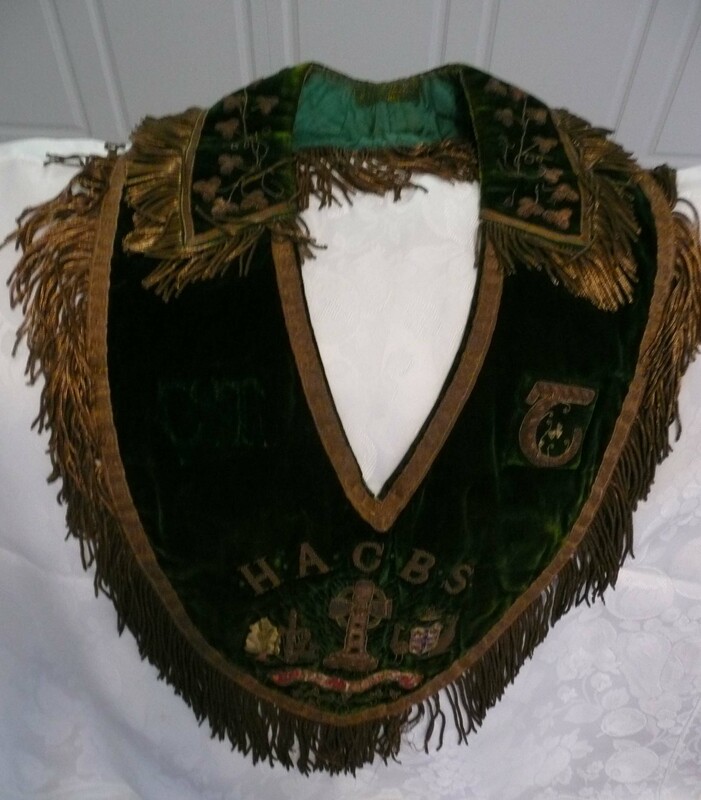 One of my grandfather’s Hibernian sashes…he had several depending on his role in the society. Leading the procession would be the Archbishop or his delegate and following behind were various groups representative of the Catholic community. I don’t remember when I first went to Corpus Christi but it may have been when I was young as we lived not far away. Certainly my memories of the procession are dominated by always seeing my McSherry grandfather marching with the Hibernian Society of which he was a life-long member. He was always easy to spot in the crowd as he was very tall with a very bald head. I think we may have marched as a parish when I was in primary school – I must ask Mum. I do recall attending at least some in my Children of Mary blue cloak, blue ribbon and medal, and white veil. I often think that the non-Catholics among us must have thought we were all a bit weird in our strange clothes. Once I started high school at All Hallows’ we attended as a group. 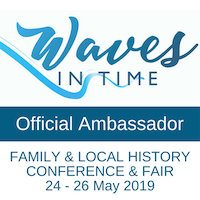 My husband, then a boarder at Nudgee College, also remembers being there with school and being traditional teenagers, it never hurt to keep an eye on the passing girls’ schools and hope they’d line up next to you in the middle of the oval. 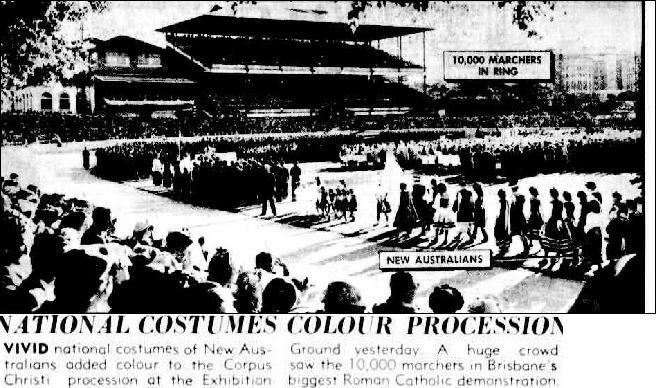 The new Australians, our recently-arrived immigrant Catholics, also marched in their traditional costumes and were very colourful and exotic as we’d never seen anything like them before. In our parish alone we had Czechs, Poles, Yugoslavs, Hungarians and Dutch Catholics….so many of the latter we even had Dutch priests. 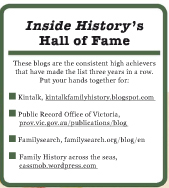 To get an outside perspective on Corpus Christi over the years I turned to the Aussie researcher’s friend Trove. It’s unfortunate that the digitised newspapers don’t go quite as far forward as I like but they still give a good sense of how important this event was to the faithful as you can see from the images I’ve included here and taken from the newspapers. 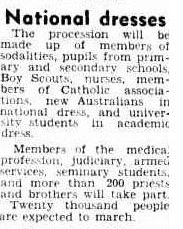 I was interested to read that prior to 1950, the event had been held elsewhere but the crowds grew too large. 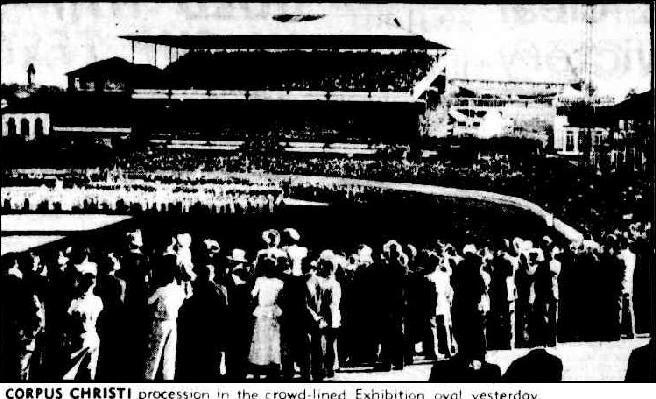 Attendance was very high: over 50,000 (1950); 70,000 (1951); 100,000 (1952); and 60,000 (1953). Not all the crowd processed but the stands and the oval would be packed. During the event, the Archbishop or the Coadjutor Archbishop would also celebrate the Benediction. Reading back through decades of newspapers, and history books, reveals how much the Irish Catholics were disliked, and in some ways feared, in the early days of our nation. Difference is rarely well-liked. When I think back even to my childhood days, I reflect on how much times have changed but also how marginalising a religion makes it more socially strident and internally cohesive.